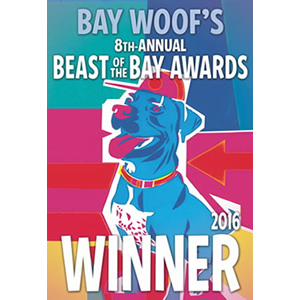 For the last 4 years, Camp Lisa cage free dog boarding has participated in the Best of the Beast of the Bay Awards put on by Bay Woof Magazine. 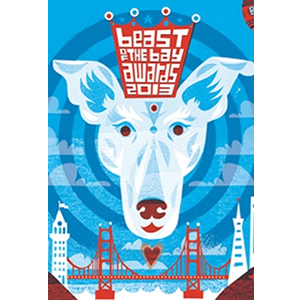 Camp Lisa has been voted “Winner” for an Overnight Dog Boarding Facility 3 times and 1st Runner Up 1 time. We want to thank all our loyal customers and their dogs for their continuous support and for voting for Camp Lisa all these years. This service is just phenomenal for pets when you go out of town. We encountered Lisa when trying to find last minute dog care after our sitter fell thru. And we are so happy we found her. Lisa is a total pro. We took our puppy Bo there, and he stayed for a week. It was the perfect solution from start to finish. Lisa has a great setup for multiple dogs to hang together. Bo hadn't spent significant time with more than 1 other dog at a time, so he really benefitted from the increased company and overall socialization. He had his own spring break... And loved it. Lisa posted pictures of the dogs on her site multiple times during the week. He made buddies pretty quickly. And he was exhausted when we brought him home, and better behaved. Between the location (back up in Bollinger Canyon in Moraga), the safe and friendly accommodations, and reasonable rates, Bo will be a return visitor to Camp Lisa. Taking my dogs to Camp Lisa has taught them, and my family, a great deal. My first dog just loved being there and making new friends. He’s always been very dog friendly and social. When we adopted our second dog, she was shy with new dogs, but found the friendliness of Lisa’s other guests too much to resist, and joined in the fun. We decided we needed yet another dog in our family, and asked Lisa to help us find one that would fit in with our current mix. She was absolutely wonderful! Her knowledge and intuition was immediately evident as soon as we walked into the kennels at the shelters. My 11 year old daughter has a big heart, and wanted to save each dog she felt no one would want. Lisa told her we wanted to choose a dog not just because it needed rescuing, but because he would be her best friend. Great advice! We found Ernie at the shelter, and my daughter couldn’t be happier. He follows her around everywhere, snuggles with her for homework and reading time, and sleeps on her bed at night. She definitely has a best friend thanks to Lisa, we couldn’t be more greatful! I have nothing but good things to say about Lisa Gillett and Camp Lisa! As I travel for business, my dog, Lexie, has been going there 1-2 times a month since I adopted her 4 years ago. This is her home away from home, and I can trust that she will be well cared for while I'm gone. I like the fact that there is is an indoor and outdoor area and lots of room for the dogs to run around. Lisa has a strong compassion for animals, and knows how to manage the dogs so that they all get along. When I pick Lexie up, she is always happy and tired! A wonderful vacation for your dog. Lots of space, outside during the day and inside at night. Lots of friends to play with and Lisa loves them all! Our dog Max loves Camp Lisa. I discovered Camp Lisa about 5 years ago, and have been quite impressed with Lisa's dog sitting ever since! Her love for animals is obvious in her surroundings as is her personal enthusiasm for all animals. It is always hard to leave your dog, but when my pooch gets to the Camp Lisa driveway, he is sooo excited to jump out of the car to not only greet Lisa, but to mingle with her other doggy "guests". When I return to I pick him up, whether it be 1 day or 2 weeks, he is well cared for, exhausted and quite happy. My dog is part of our family, and I would not entrust him to just anybody. I drop him off at Camp Lisa and I have not one single worry. I know he is on his "doggy" holiday... Camp Lisa is a perfect place to leave your pooch. Camp Lisa takes great care of my best friend, Bruno when I am out of town. I feel confident leaving him there, because he has a great time, and gets lots of love and attention. I would recommend Camp Lisa to anyone who needs pet sitting. I can't say enough good things about Lisa Gillett and Camp Lisa! We have 5 dogs, 3 labs, a beagle, and a Newfoundland, and have been boarding them at Camp Lisa for over 5 years! Growing up, my father was the executive director of the Berkeley Humane Society, so I am very sensitive to animal care and treatment, and I have complete confidence in Camp Lisa! Lisa has a huge indoor/outdoor area for the dogs to roam and play, lots of toys! !, shade, and dirt to dig up!! (my dogs love to dig!) She never crates them or confines them to runs. They are always free to explore and interact with other dogs. The indoor area is especially important to me during the rainy season. 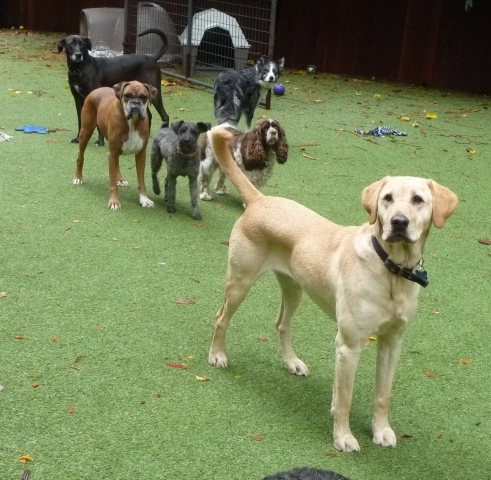 We have hired Lisa to provide obedience training to our dogs during their boarding time as well! She is fantastic. Her knowledge about training is amazing, and she is willing to help train the humans :-) as well! She loves what she does, and it is obvious watching her interact with the dogs!!! Camp Lisa is #1 in our book!! When we were looking for a place to leave our 9 month old puppy for the very first time while we went on vacation, a friend recommended Camp Lisa. Owner, Lisa Gillett, provides dog sitting services in her home. She provides spacious outdoor and indoor areas for the dogs. The daily rate is $30 which compares favorably to boarding at the local vet. We were very pleased with the service, and will definitely board our dog there again in the future.